Drip irrigation was invented in the mid-1800s, but has not been popular with landscape irrigation until the 1960s when new materials suitable for landscape irrigation were developed. Recent advances in materials have led to the expansion of drip components and dripline equipment. 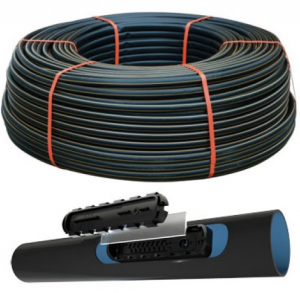 Drip irrigation for landscape is the slow and frequent application of water to the plant through emitters placed along or inline a water irrigation line (such as polyethylene tubing). The dripline can be placed at the surface near the plant to be irrigated or placed in rows to irrigate an area. Sub-surface irrigation is the application of water via dripline below the soil surface. 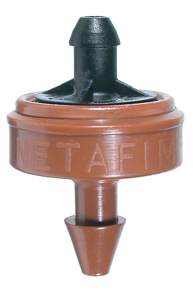 Many manufacturers of drip irrigation equipment produce dripline and drip emitters that can work either at the soil surface (on line) or below the surface (sub-surface). 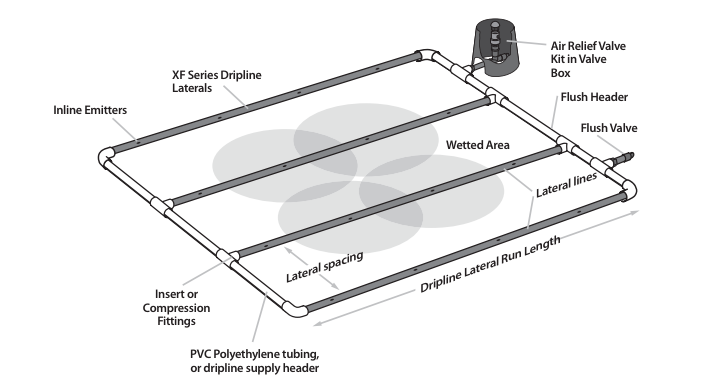 Dripline End Feed Layout, Image courtesy of Rainbird Corp.
Drip Emitters have small flow rates that range between .25 and 2.0 gallons per hour (GPH) and are typically installed along a polyethylene hose at intervals dependant upon plant spacing. The size and type of plant will determine the numbers and size of emitters (as well as the water window). Drip emitters are installed by hand (or with an insertion tool) along a blank polyethylene tube, shown below. Image courtesy of Netafim Corp.
Dripline tubing has in-line emitters already built into the tubing that is pressure compensated for precise flow control throughout the irrigation zone. Typical flow rates for inline emitter tubing is from 0.2 to 0.9 gallons per hour (GPH) with emitter spacing from 6 inches to 18 inches. Different manufacturers have somewhat similar flow rates and spacing of dripline emitters. The image shown below details inline emitter tubing. Low Flow Rates:Water is applied at a low flow rate thru the dripline. Typical flow rates for drip irrigation my range from 0.2 to 2.0 gallons per hour (GPH). Longer drip irrigation run times: Because of the lower flow rates, longer run times (hours) are required, when compared to sprinkler run times (minutes). Frequent drip irrigation intervals: Longer run times can be split up into frequent intervals. Run times, soak cycles can be scheduled based upon the soils involved. For sandy soils, shorter run times with higher flow rates, for clay soils longer run times (with lower flow rates). Consult your manufacturers drip irrigation catalog for exact dripline, flow rates and spacing. Application: Water is applied directly at the plants root zone where a majority of its roots are located. This increases the efficiency of the irrigation system. By applying drip irrigation directly to the root zones little water is lost via overspray or atomizing.